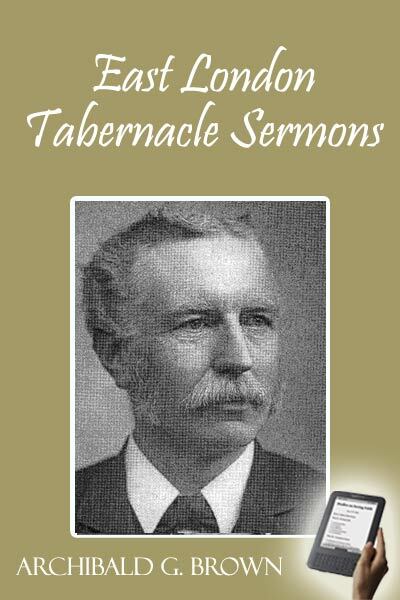 Archibald Geikie Brown (18 July 1844 – 2 April 1922) was a Calvinistic Baptist minister; a student, friend, and associate of Charles Spurgeon; and from 1908 to 1911, pastor of the Metropolitan Tabernacle in London, the church earlier pastored by Spurgeon. This is an extraordinary collection (50 sermons in all): each is a gem. Amazingly, Brown was in his late twenties when he wrote most of these , and in my opinion they rival his mentor’s passion and eloquence for the Gospel. When writing our last Preface, we were worshipping in “Stepney Green Tabernacle,” now in “The East London.” Then the number of our hearers was about 1300, now nearly 3000. Though mentioning the increase of numbers, we are far from looking upon that as the criterion of blessing. Had not conversions also increased in proportion, we would only have recorded the fact in sorrow. But thank God they have. Since the opening of the building last February, we have seen, with a view to membership, considerably over two-hundred persons, most of whom have been brought by grace out of the world during the year. Doubtless, some may be ready to say, “Is not this vain glorying?” Our answer is that we record the fact simply to the praise of our God, and as a statement due to those who so generously helped to build the place. Concerning the Sermons, we can only say that, as none of them were delivered from manuscript, or even copious notes, but either reported at the time, or written from memory afterwards, they make no pretensions to literary refinements. They appear as preached to a large and mixed congregation. We always send to our short-hand writer to take down that Sermon we think most likely to arouse the sinner or comfort the saint, not the one we might imagine would read the best. Many have been the encouragements we have received. From India, Australia, and Canada, good news concerning the Sermons has reached us, while we are constantly hearing of their being made a blessing in our English villages. Most heartily do we thank those friends who have interested themselves in their circulation, and aided us in our effort to spread the truth and win souls. The two previously published volumes being quite sold out, and applications having been made for back sermons, also out of print, our publisher has felt justified in reprinting those missing, and bringing out the entire series in one book.1 Such as it is, we now offer it to the public, and we pray you kind reader, forgive its faults, excuse its eccentricities, aid its circulation, and love the Saviour proclaimed in its pages. Hard Work And Bad Pay. Do Not Hurt the Child. The First Sermon on Returning Home. David’s Malady and David’s Medicine. What Christ Has Done for Me. Christ’s Own Joy is Our Joy. God’s Pool and Man’s Porches.